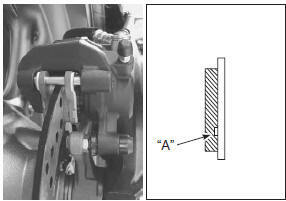 The extent of brake pads wear can be checked by observing the grooved limit line “a” on the pads. When the wear exceeds the grooved limit line, replace the pads with new ones. Refer to “rear brake pad replacement” . replace the brake pad as a set, otherwise braking performance will be adversely affected.